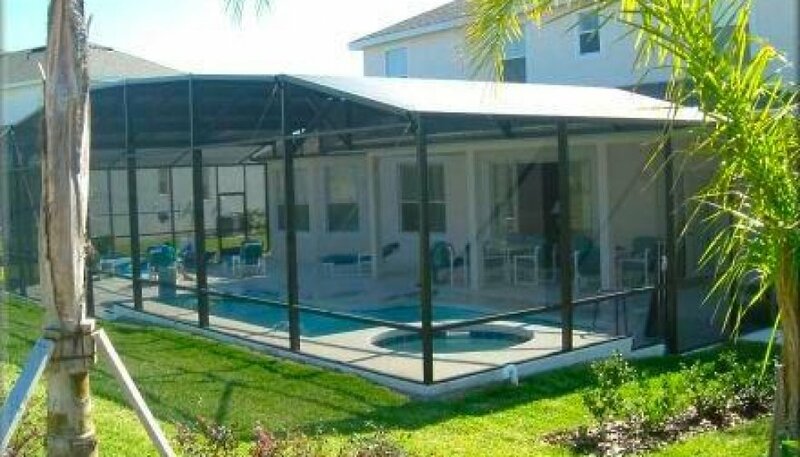 Oversized pool deck, inside an enlarged Pool Cage. 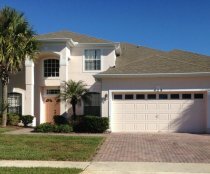 The villa is ideally located to take full advantage of all of Florida's attractions. 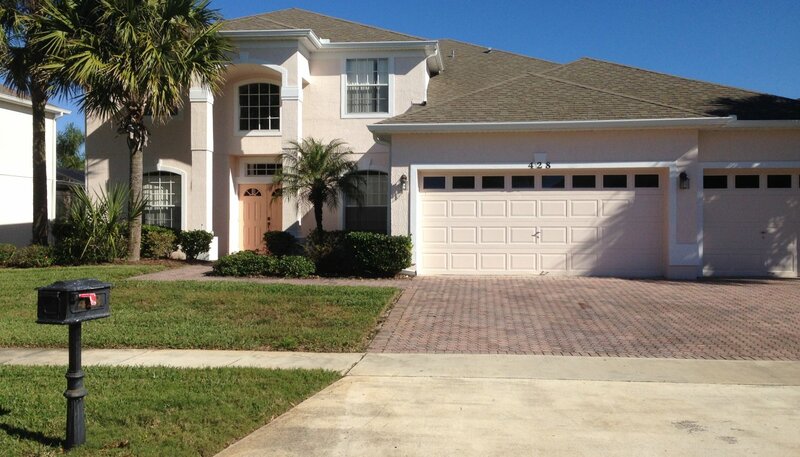 Situated South West of Orlando, it is within easy reach of all the major theme parks. The Atlantic coast and Gulf of Mexico are each an hour's drive away, giving access to beaches and numerous other attractions. 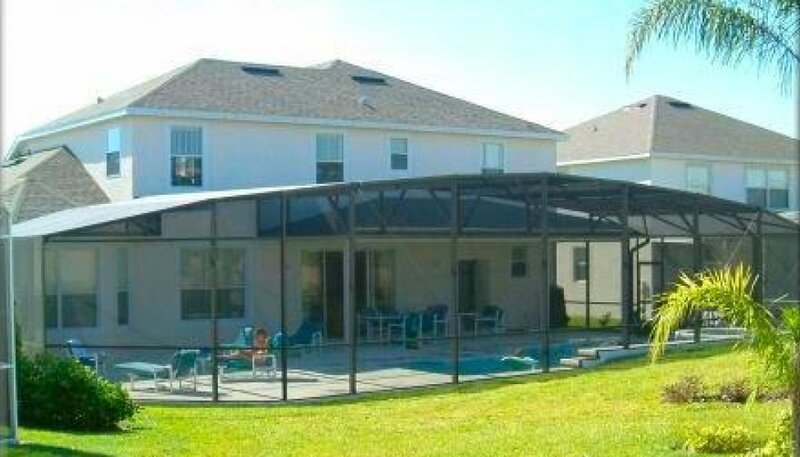 The luxurious 30' x 15' pool and spa overlooks the7th fairway and 8th tee of the golf course and offers the perfect way to relax in the evening warmth of the Florida climate. The pool area is provided with 2 patio tables (1 x 6 seater & 1 x 4 seater), 10 x chairs and 4 x sun loungers for your enjoyment and comfort. 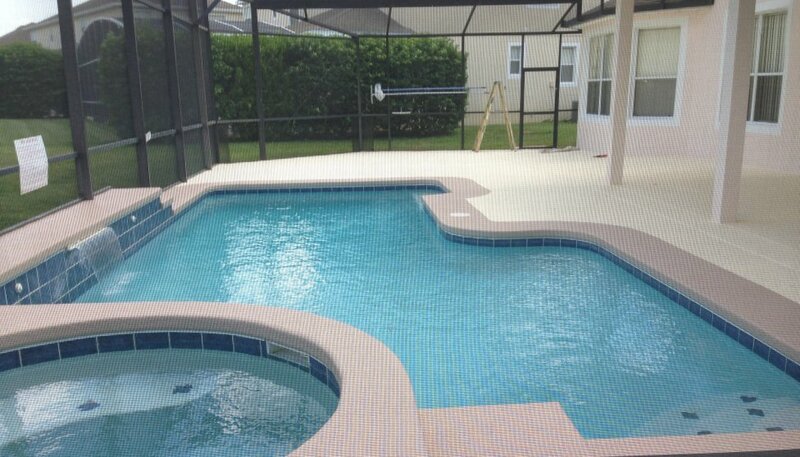 Other features include a waterfall, 2 water jets, and outdoor lighting, for those balmy nights! For the ultimate in alfresco dining, we can provide a rental gas BBQ through our management company - please request this at the time of booking and we will advise you of the cost. 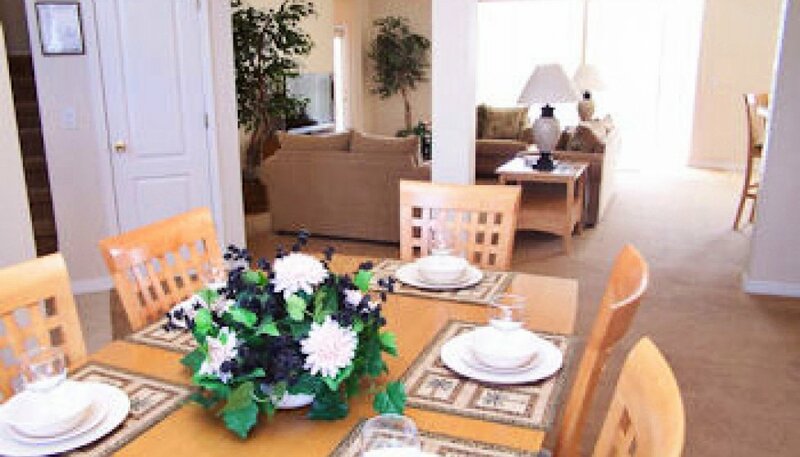 The spacious family room is comfortably furnished to allow our guests to relax and they can choose their entertainment to suit their mood, ranging from the 36" cable TV, DVD and Wii and XBox games consoles. A selection of DVD's and Xbox games are provided for your enjoyment. This room also has a ceiling fan fitted. 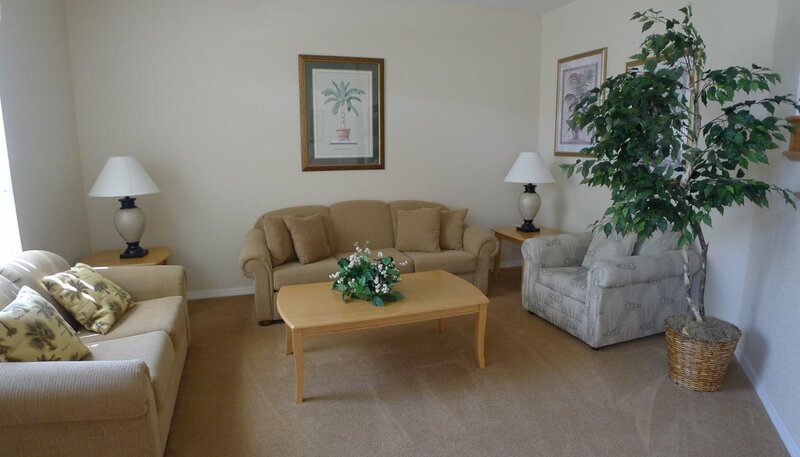 Should you want to relax in a quieter area, our small living room provides a light and airy space where you can chill out away from the Family room. 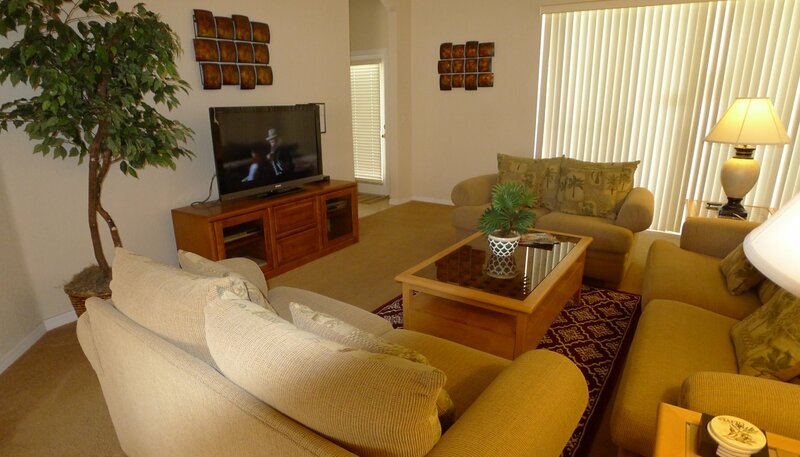 Here you will find 2 large comfortable sofas in which to relax and rest those weary limbs at the end of the day. 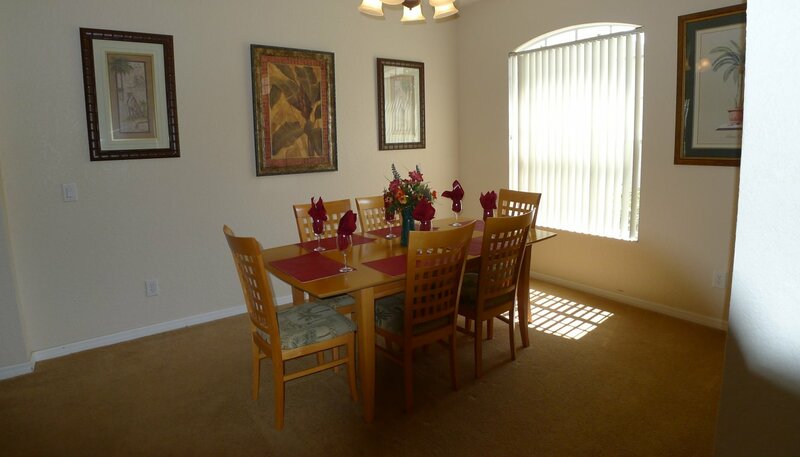 There are two dining areas, a formal dining area and a breakfast nook. The breakfast nook looks out on to the Lanai and pool area and has seating to a breakfast bar in addition to the table and chairs. The formal dining area is located adjacent to the living room and has a large table beautifully set out for those special dining occasions. 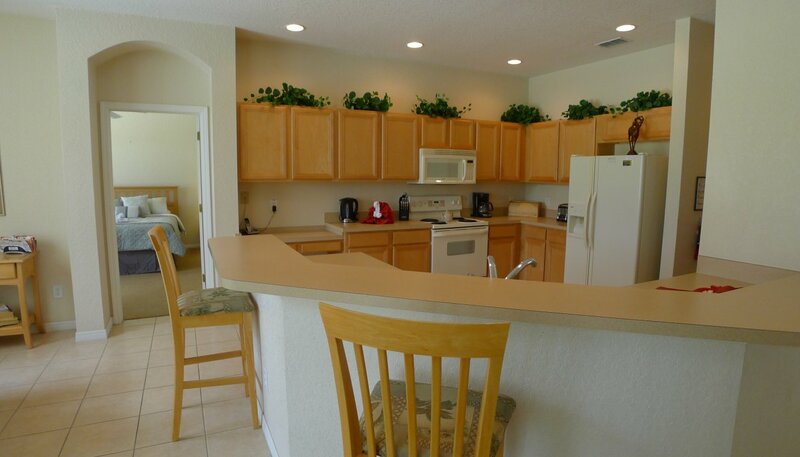 The large open plan kitchen comes complete with all mod cons to make your holiday as relaxing as possible. Amenities include full size cooker, waste disposal, fridge/freezer, microwave, dishwasher, coffee maker, crockery, cutlery and a toaster. All that's needed is the food and drink !! 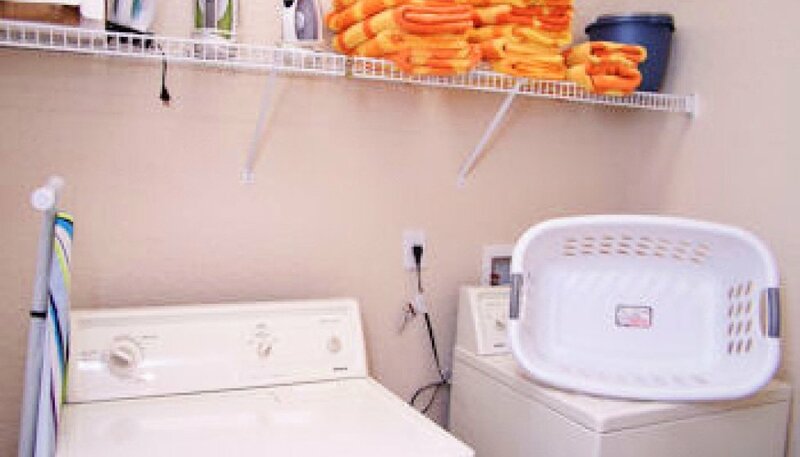 The laundry room provides a washing machine, tumble dryer, ironing board, iron and clothes airer for your convenience. 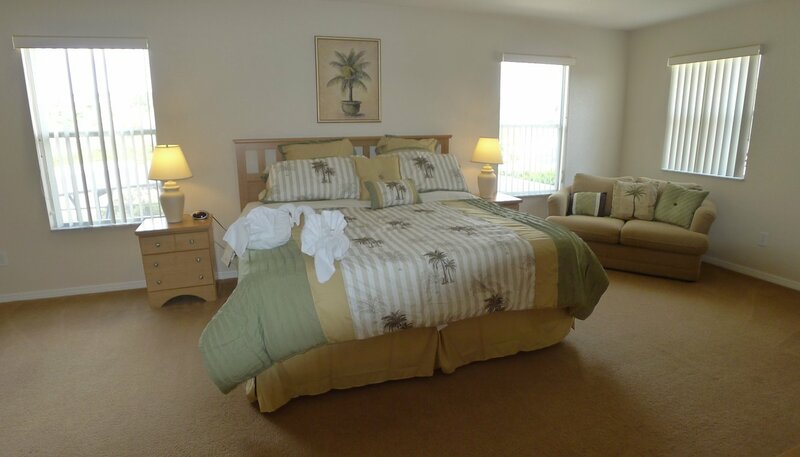 A spacious ground floor suite with a queen sized bed. This room has a large mirrored built in wardrobe, owners closet, ceiling fan, Cable TV, clock radio. There is also a safe in the mirrored wardrobe for valuables (additional cost). 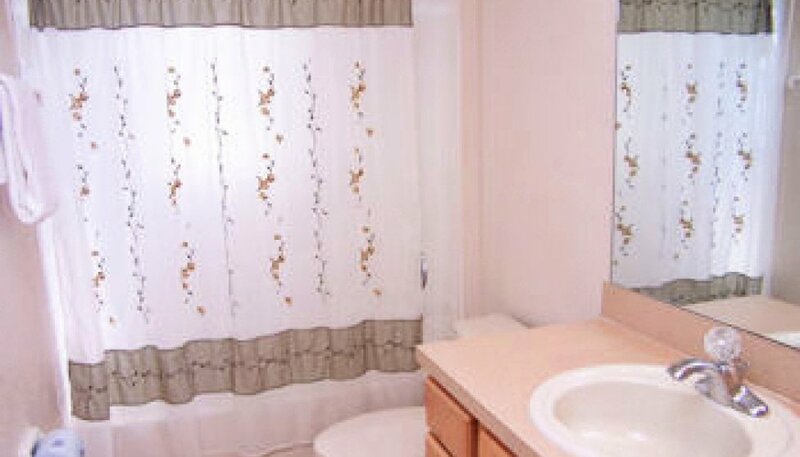 The ensuite bathroom with 2 individual vanity units, large corner bath, huge walk in shower and separate WC. A hairdryer is provided in the vanity unit. This large room has twin beds, a built in closet and chest of drawers providing plenty of clothes storage space. There is a clock radio and ceiling fan provided for comfort. 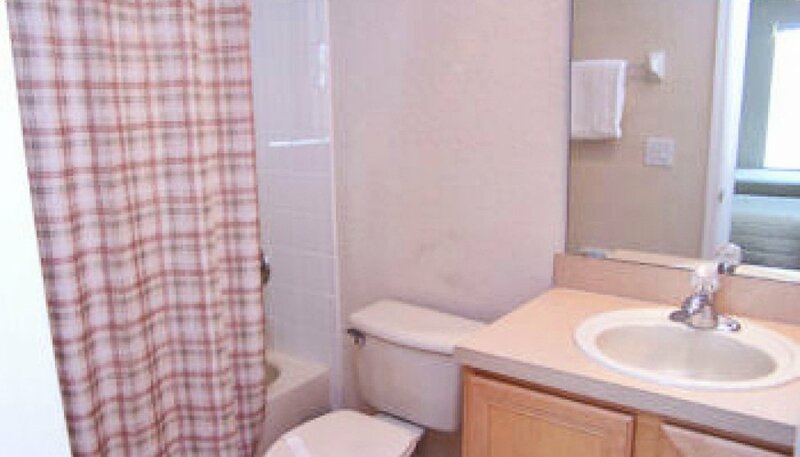 This shared family bathroom (adjacent to bedroom 5) has a bath with shower over, WC and built-in sink unit. A hairdryer is also provided. This wonderful room is furnished with a new king bed with matching furnishings and provides a large walk-in closet and ample drawer space. This room is special, and has its own 27" cable TV and clock radio. It enjoys views over the golf course. The enclosed en-suite bathroom has a vanity unit, large corner bath, separate walk-in shower unit and separate WC cubicle. 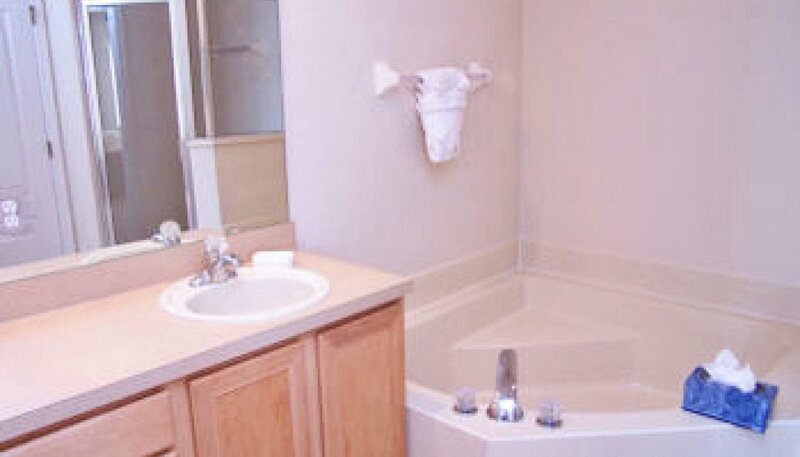 There is also a hairdryer in the vanity unit. This bedroom features a twin single beds, built-in double wardrobe and drawer space is provided along with a clock radio and ceiling fan for your comfort. 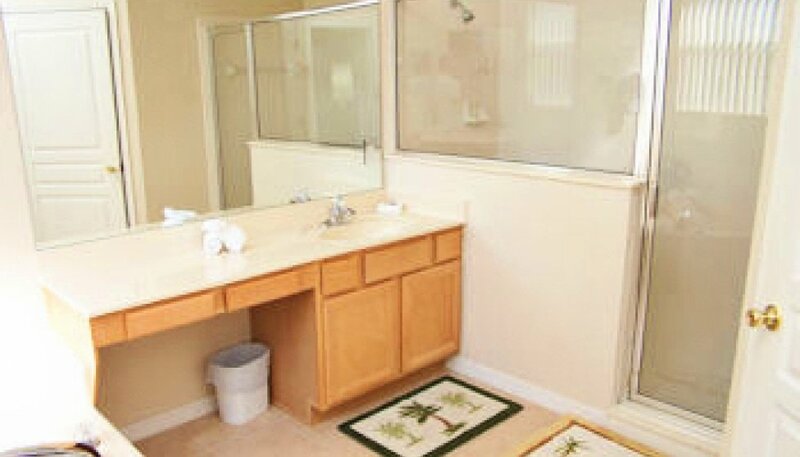 The ensuite bathroom has a bath with shower over, single vanity unit and WC. A hairdryer is also provided in the vanity. 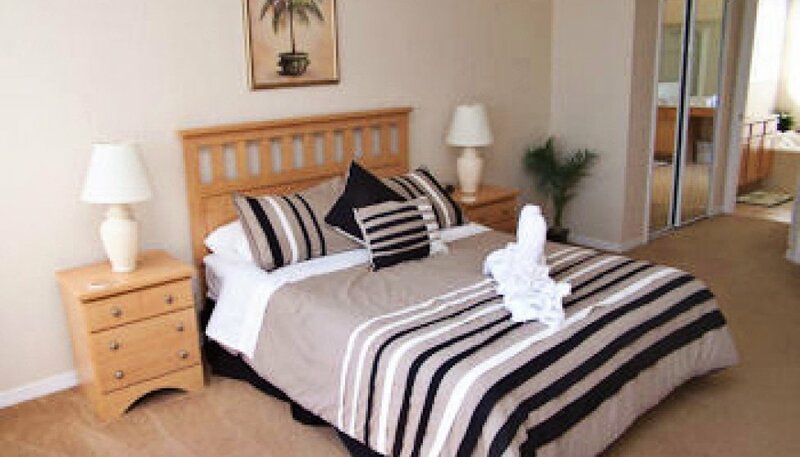 This room contains twin single beds, with matching furniture which make this a very comfortable room. 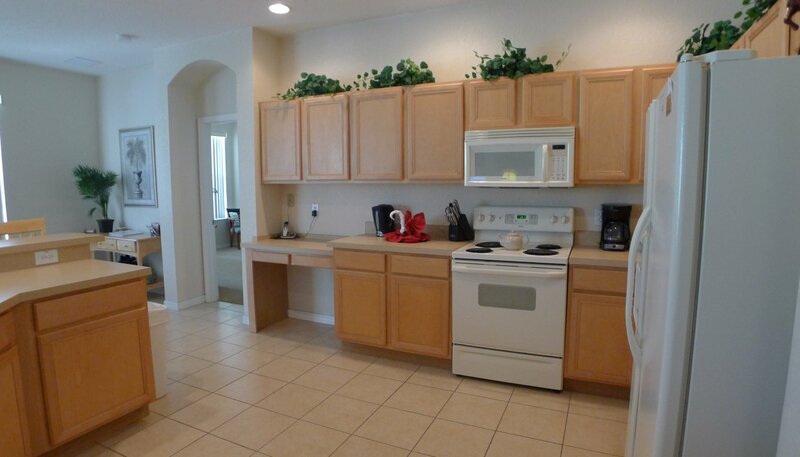 In addition there is a large walk-in closet, ceiling fan and clock radio. Have to say that we have been going to Highlands Reserve every year for the last 10 years and have not stayed in a better house! 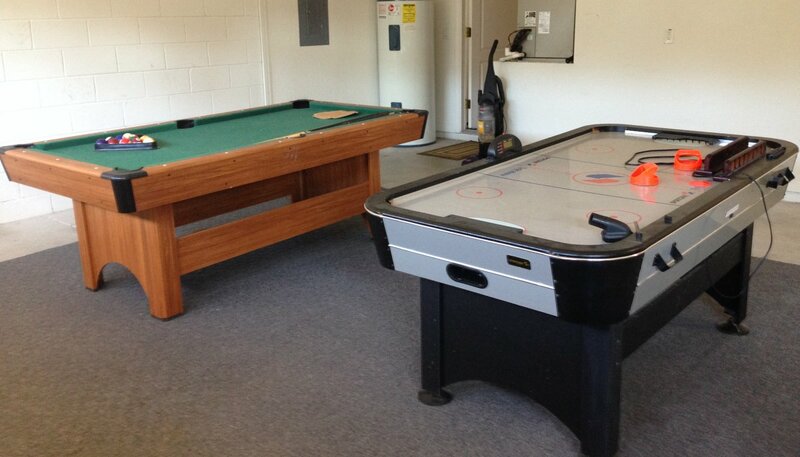 Lovely place, very clean and a great pool area with an overall excellent feel to the house and very comfortable. Thank you, your house was a home and was everything your website showed it to be. We felt very relaxed and comfortable in the lovely surroundings. 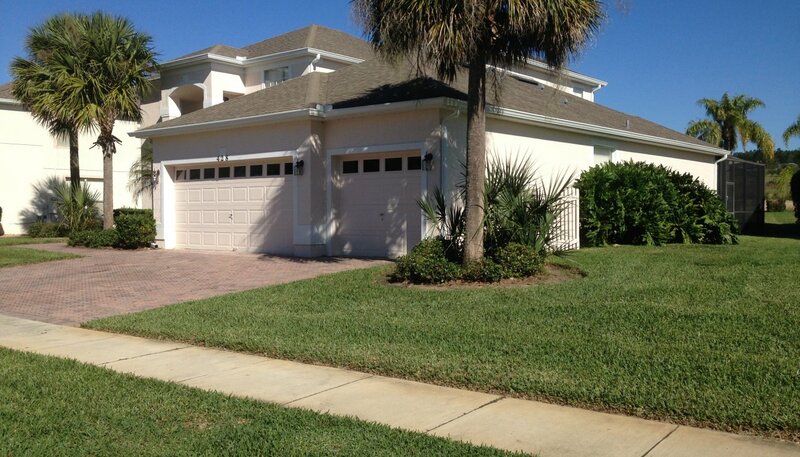 I guess I have never felt envy before but if I had a home like that I would be living a Floridian life !!! We had a superb 3 weeks and I guess the average temp while we were there was more like July / August. To summarise I don't think you can offer much more! The house was perfect and we really enjoyed it we have already given a couple of friends your website address and hope they choose to contact you ! Delighted with the superb accomodation and space. 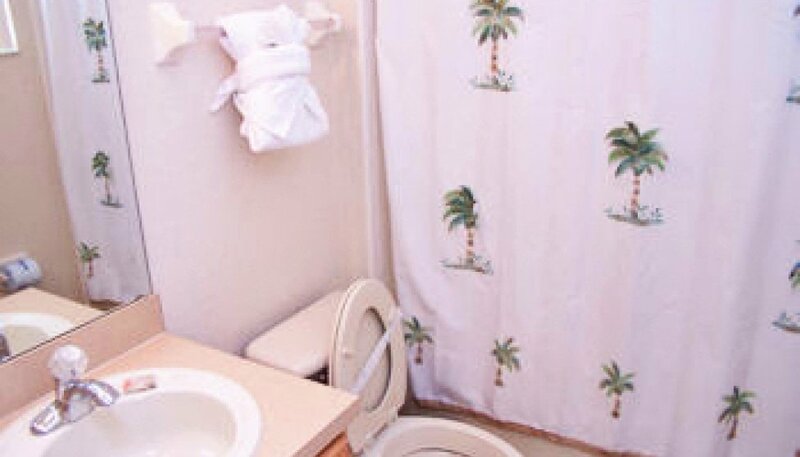 5 ensuite rooms is wonderful. Loved the pool area. Just what we had hoped for.